Parasol Teak Furniture was established in 1996 and is now considered to be one of the leaders in the field of teak outdoor furniture. This teak wood furniture is very solid and dense, it doesn’t require much maintenance and is resistant to hot temperatures, high humidity and insect attack. Every year 30 new designs are presented. The Parasol Teak Furniture quality assurance team controls every single piece of furniture through all stages of production. FIM is a company specialized in the production of large umbrellas with over 75 years of design and production expertise. Their products are a fusion of tradition and technology: solid umbrellas, created with the finest quality materials, they exemplify the linear simplicity of modern contemporary style. FIM makes an art of their profession to serve and satisfy the needs of their customers. Backyard Adventure is the premium play-set division of Backyard Discovery™. 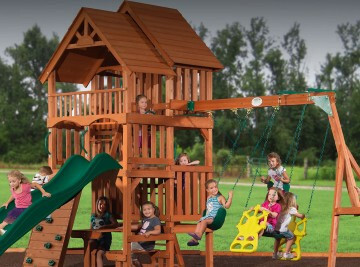 They make cedar play-sets that are modular and can be customized in hundreds of combinations, creating just the right play set for every backyard. When you buy a Backyard Adventures play set, you not only get a superior product but also professional services that ensure the entire buying and installation process exceeds your expectations.